View our platinum diamond wedding rings here. Platinum Diamond wedding rings haven't always been popular but in recent years they have surged in popularity. Traditional diamond wedding rings are made out of yellow gold and they have a solitaire diamond in the center of the setting. This was the type of ring that was popular for many decades and to this day it is still the most commonly purchased ring. Over the years, the wedding ring industry has evolved and grown into an industry with much more versatility and choices. There are many different styles of wedding rings to choose from these days and no matter what your tastes are, you and your partner are sure to find the perfect rings to symbolize your union. 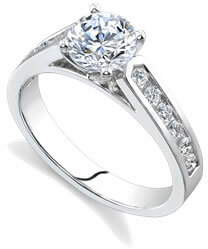 Platinum diamond wedding rings are a popular choice of ring style. Platinum is a wonderful metal that looks as expensive as it is. Platinum is more expensive than gold but worth every penny. It is one of the rarest of all metals. There was a time when platinum was not used for anything other than armaments. The use of platinum in jewelry was forbidden until the 1940’s. Once the war ended, the use of platinum in jewelry soared all over the United States. Now platinum diamond wedding rings are more popular than ever. Platinum sets off the color, sparkle and clarity of a diamond in a way that gold is not capable of doing. Platinum diamond wedding rings are much more durable than gold rings. Platinum is one of the hardest metals, which makes it especially good for men’s wedding rings. Platinum diamond wedding rings are one of the few rings that men can wear everyday even if they work with their hands. Between the hardness of the stone and that of the metal, these rings are very hard to damage compared to gold wedding rings. Gold is a much softer metal and it can bend and scratch with relative ease. A love like yours is unique and hard to find; therfore, it only follows that your wedding rings should be just as rare and special. Platinum diamond wedding rings are your only choice that offer such a degree of rarity and uniqueness.